Free to Play version of Dead or Alive 5 Last Round featuring fully playable single player and online modes (Story Mode is not included). The Roster is limited to four characters: Ayane, Hayate, Kasumi and Ryu Hayabusa. Does not include the Soft Engine, enhanced particle effects, and extra stages added in the PS4 and Xbox One versions. Free from October 3rd through October 30th. Players whose Community IDs include certain characters (? / : * " < >) may encounter problems saving game data. Game data may not save or load properly if the Community ID is changed after a game is saved. 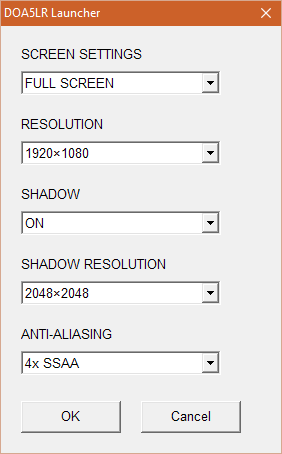 Video settings can only be changed via the configuration tool. Can be forced through video card control panel. Enabled by default. Can be forced off in the graphics driver. Cutscenes and menus run at 30 FPS. The game shows Xbox Controller and keyboard button prompts at the same time. Music, Sound Effects and Voices. ↑ 1.0 1.1 File/folder structure within this directory reflects the path(s) listed for Windows and/or Steam game data (use Wine regedit to access Windows registry paths). Games with Steam Cloud support may store data in ~/.steam/steam/userdata/<user-id>/311730/ in addition to or instead of this directory. The app ID (311730) may differ in some cases. Treat backslashes as forward slashes. See the glossary page for details. This page was last edited on 16 February 2019, at 16:15.